It all starts with a dream. Speaking your dreams out loud and having someone listen and be interested is one of the most empowering things you can do for yourself and those around you. Have You ever heard an older person dis (bad talk) on younger people or say things like, “Kids these days are lost, they have nothing better to do than talk on their cell-phones, text and play video game”? Everyone has, and this disconnect across generations hurts all of us. I believe that much of this is the result of how quickly the technology has evolved. Youth of today are the most media-empowered generation in the history of the planet. They have grown up bombarded with medias, with more information at their finger-tips than all the previous generations combined. It is all so overwhelming, and the temptation to slip away into a mindless video game to avoid it all is so easy. Yet, like every other generation, young people dream about the future and about what is possible. It is their world and their future that is at stake when politicians and big business prioritizes profits over people and planet. It can be downright depressing to know so much about the problems of the world, that’s why it is more important now than ever to dream. The project was originally sponsored by Flip Cameras, and we were so excited for a big launch, but then Cisco was bought by Dell and The Flip line of video cameras discontinued. But now, most people have video cameras right on their phones, and the ability to shoot a video and upload it is easier than ever. Visit the website, learn about the project, and then add your voice! Here’s how it works, just make a short video of yourself, or your friends, answering two very simple questions. 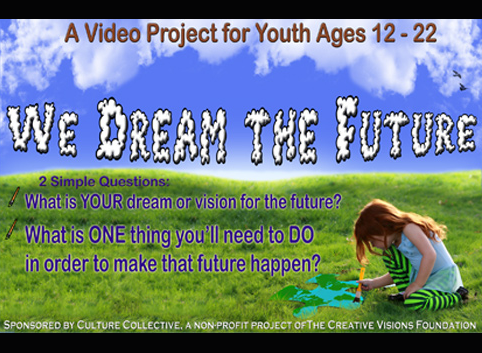 First question is, “What is your dream for the future?”, second question is, “What are you going to do to make that dream happen?” You can change your mind a million times between now and the future, but this is about voicing your dreams and having them be heard by your piers and those that are older than you. The site is filled with links and inspirational videos too. So what are you waiting for? The world wants to hear your dream! Interested in this project? Get involved! Jacob blogs for Huffington Post and others in addition to Culture Collective. He specializes in social media, and cross-platform (or trans-media) content and campaigns. Meditation, playing piano, exploring nature, seeing live music, and going to Hopi Dances are some of his passions. As a co-founder of unify.org, Jacob lives for community and believes that we are all interconnected with our own special gift to offer the world.